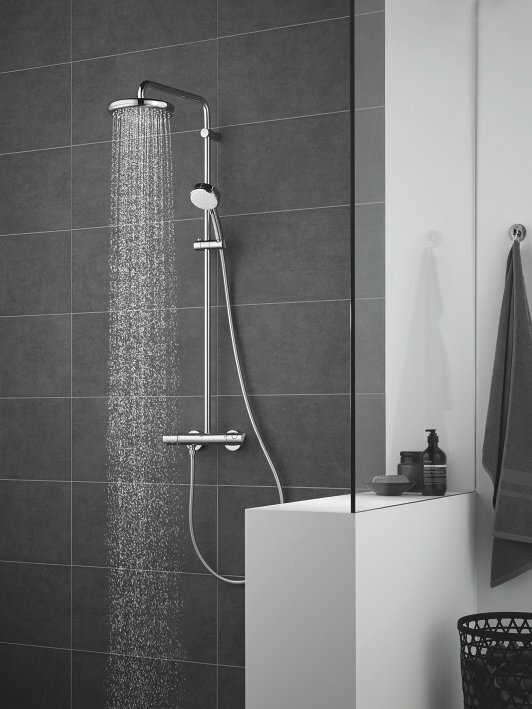 For style, performance and reliability choose a GROHE shower system. Our shower systems combine several industry-leading technologies, which ensure outstanding performance and an unbeatable shower every time. Purchase your qualifying GROHE shower system from a GROHE retailer and complete the cashback claim form below. Offer on purchases made from 1st February 2018 until the 30th June 2018. All claims must be made by the 31st July 2018. Proof of purchase is required. Terms and conditions apply. With its crisp, cylindrical profile and distinctive bevelled detailing, the New Tempesta System is the perfect choice for modern bathrooms. Intuitive Shower Controls. The innovative GROHE SmartControl technology offers spray selection and volume adjustment in one shower control system. 1.1 GROHE offers the GROHE Shower Systems cashback promotion (the Promotion) to you if you make a purchase of a qualifying GROHE Shower System from a retailer located in the United Kingdom (UK) and Republic of Ireland (ROI) participating in the Promotion (a Participating Retailer). 1.2 Before making a claim, please check with your retailer, and confirm it is a Participating Retailer. 1.3 To claim your cashback under the Promotion you must purchase, or have purchased, the Product from a Participating Retailer, in a single transaction between 1st February to 30th June 2018, inclusive (the Promotional Period). 1.4 All other products and retailers are excluded. Purchases of the Product made outside the Promotional Period, or purchases of a second hand, refurbished or reconditioned, or counterfeit Product, will not qualify. 1.5 You must be aged 18 or over and must be resident in the UK or ROI. By submitting a claim, you are deemed to have agreed to be bound by these terms and conditions. 1.6 The Promotion may not be used in conjunction with any other offer or promotion. 1.7 Claims are limited to one per household. You may not submit a claim under the Promotion if you are an employee of or otherwise associated with GROHE, its holding or subsidiary companies or its agents, and GROHE will disqualify any such claims. 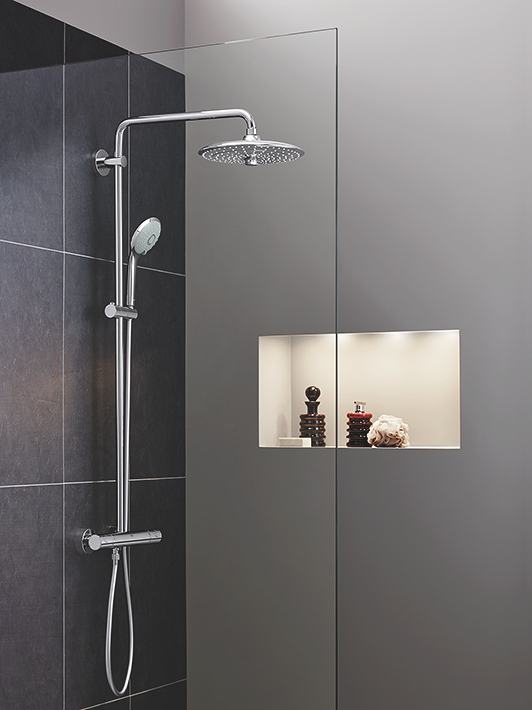 2.1 To claim your cashback, please register your purchase using the online form at https://www.grohe.co.uk/en_gb/shower-cashback-promotion and upload your full purchase receipt showing the date of purchase (not deposit receipt). You must wait 28 days from the date of purchase BEFORE submitting your online claim. All claims must be submitted by midnight on 31th July 2018. Any claims submitted after this time or outside of the closing date, will not be accepted. 2.2 If you are unable to register your purchase online, you can send a copy of your full purchase receipt to the address at section 4.5, complete with the printed pdf of your online application. We must receive your claim form by 31th July 2018. 2.3 GROHE does not accept any responsibility for claims that are misdirected, lost, mislaid, damaged or delayed in transit, regardless of cause, including, for example, because of postal failure, equipment failure, technical malfunction, systems, satellite, network, server, computer hardware or software failure of any kind. Claims by fax or telephone will not be accepted. Illegible, incomplete or altered claim forms will be deemed void, as will claim forms not completed in accordance with these terms and conditions. GROHE will not accept proof of posting or transmission as proof of receipt of claim submission. 3.1 Please allow up to 28 days from the date we receive your claim form and all supporting documents, for us to process your claim and check that it meets these terms and conditions. 3.2 If you make a successful claim, you will receive the cashback amount. Upon receipt and verification of your claim, we will issue you a cheque for the cashback amount. You must bank the cheque within 6 months of the date of issue. No alternative arrangement can be entered for the cashback and we do not offer cash or payment by BACS transfer. 3.3 GROHE does not accept any responsibility if you do not present your cheque for payment. 4.1 GROHE reserves the right to withdraw, amend or replace the Promotion or these terms and conditions without prior notification. If unforeseen circumstances make this unavoidable, your legal rights are not affected. 4.2 GROHE reserves the right to verify the eligibility of all claims to protect itself against fraudulent, invalid, or repetitive claims including, without limitation, to require you to prove that you did not return the Product within the period of 28 days from the date of delivery or purchase. Claims for returned products, bad faith or fraudulent entries or claims that otherwise do not meet these terms and conditions will be invalidated. 4.3 To the fullest extent permitted by law, GROHE shall not be liable for any loss, damage or injury of any nature howsoever caused, sustained by any claimant under the Promotion. Nothing in these terms and conditions shall exclude or restrict GROHE’s liability for personal injury or death caused by GROHE's employees or agents. 4.4 Any personal data supplied by you will be used by GROHE and its agents or associated group companies solely for administering the Promotion and in accordance with data protection legislation. 4.5 The Promotion is administered by GROHE Limited (Company Number: 00770795), a limited company incorporated in England and Wales, whose registered office is at World Business Centre 2, Newall Road, London Heathrow Airport, Hounslow, Middlesex, TW6 2SF, United Kingdom. All trademarks are owned by or licensed to GROHE. GROHE uses reasonable efforts to ensure that information it provides to you is accurate, complete, and up to date. It does not represent that the information will be error-free. 4.6 The Promotion and these terms and conditions, are governed by English law and are subject to the non-exclusive authority of the English courts. If you live in Scotland, you can bring legal proceedings in either the Scottish or the English courts. If you live in Northern Ireland, you can bring legal proceedings in either the Northern Irish or the English courts. If you live in the ROI, you can bring legal proceedings in the Irish courts.